Objectives Warming intravenous fluids is essential to prevent hypothermia in patients with trauma, especially when large volumes are administered. Prehospital and transport settings require fluid warmers to be small, energy efficient and independent of external power supply. We compared the warming properties and resistance to flow of currently available battery-operated fluid warmers. 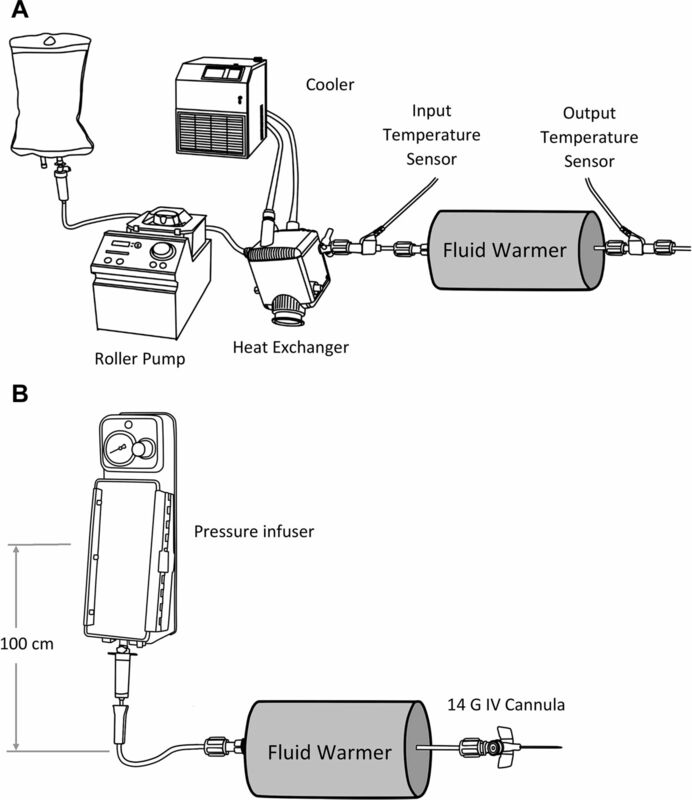 Methods Fluid warming was evaluated at 50, 100 and 200 mL/min at a constant input temperature of 20°C and 10°C using a cardiopulmonary bypass roller pump and cooler. Output temperature was continuously recorded. Results Performance of fluid warmers varied with flows and input temperatures. At an input temperature of 20°C and flow of 50 mL/min, the Buddy Lite, enFlow, Thermal Angel and Warrior warmed 3.4, 2.4, 1 and 3.6 L to over 35°C, respectively. However, at an input temperature of 10°C and flow of 200 mL/min, the Buddy Lite failed to warm, the enFlow warmed 3.3 L to 25.7°C, the Thermal Angel warmed 1.5 L to 20.9°C and the Warrior warmed 3.4 L to 34.4°C (p<0.0001). 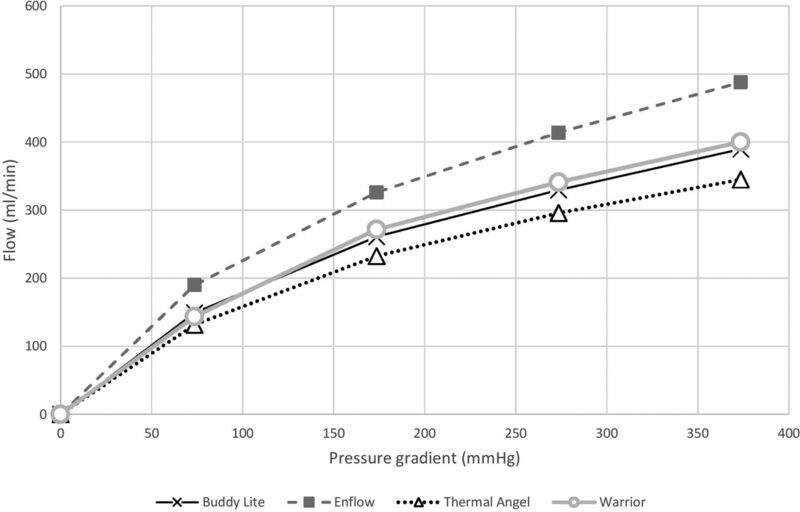 Conclusion We found significant differences between the fluid warmers: the use of the Buddy Lite should be limited to moderate input temperature and low flow rates. The use of the Thermal Angel is limited to low volumes due to battery capacity and low output temperature at extreme conditions. The Warrior provides the best warming performance at high infusion rates, as well as low input temperatures, and was able to warm the largest volumes in these conditions. Previous studies have shown significant differences among battery-operated fluid warmers, in both output temperature and the time required to reach operating temperature. 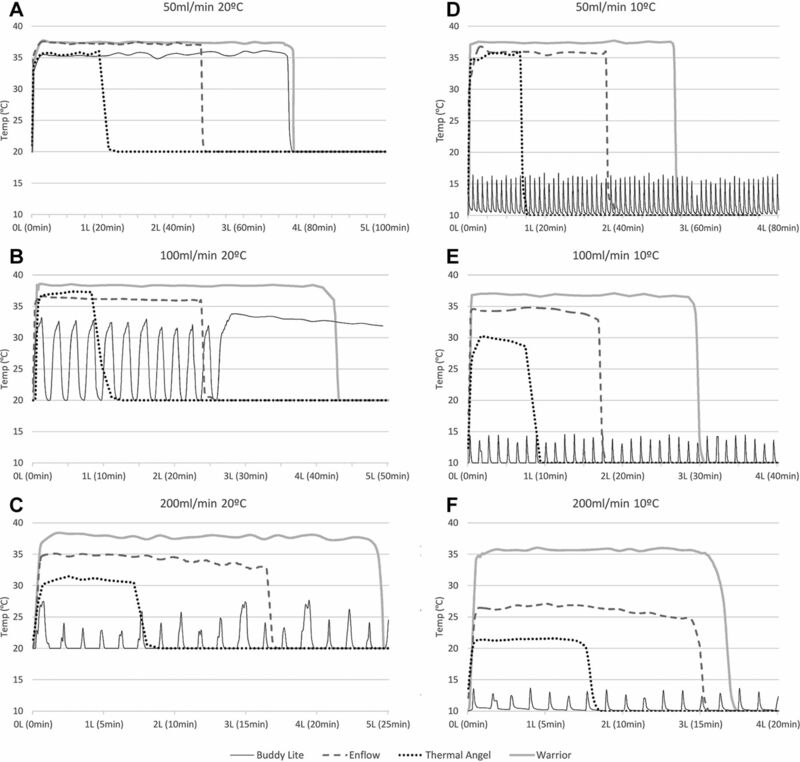 This study systematically compared the performance of the four commercially available in-line, battery-operated fluid warmers using a cardiopulmonary bypass pump apparatus to provide constant and reproducible conditions. Performance was compared in a range of input temperatures and flow rates to assist clinicians in selecting the right fluid warmer for their specific requirements. Hypothermia is a common finding in patients with trauma.1 Intravenous fluid and blood warming is considered standard care to reduce hypothermia,2 especially when administrating a large volume of fluids or blood. In-hospital blood warmers are large, heavy and depend on external electric AC power and are therefore impractical for field, prehospital, retrieval and military applications. Despite attempts to design a safe chemical reaction-based fluid warmer,3 in-line portable battery-operated units are still the most commonly used in out of hospital applications. Previous studies that examined portable fluid warming devices4 5 concentrated on early output temperature and the time to reach the maximal temperature. We evaluate the heating performance over time, the volume that can be effectively heated and the flow resistance of four currently available in-line battery-operated fluid warmers: Belmont Buddy Lite (Belmont Instrument Corporation, Billerica, Massachusetts, USA), Carefusion enFlow (CareFusion Corporation, San Diego, California, USA), Thermal Angel TA-200 (Estill Medical Technologies, Dallas, Texas, USA) and QinFlow Warrior (QinFlow, Tel-Aviv, Israel). The requirement for ethical approval was waived by the Institutional Review Board as this was a laboratory investigation without the involvement of human or animal subjects. We performed an in vitro, prospective, head-to-head comparison of the heating performance and flow characteristics of Belmont Buddy Lite (Belmont Instrument Corporation), Carefusion enFlow (CareFusion Corporation), Thermal Angel TA-200 (Estill Medical Technologies) and QinFlow Warrior (QinFlow). The study was performed at the Department of Anaesthesiology, Rambam Health Care Campus, Haifa, Israel. The active warming properties of the four fluid warmers were evaluated by passing constant flows of normal saline at set input temperatures through the warmers. Flow rates were controlled using a cardiopulmonary bypass roller pump (S5 Roller pump 150, Sorin Group USA, Arvada, Colorado, USA). Input fluid temperatures were controlled using a cardiopulmonary bypass oxygenator and heat exchanger (QUADROX-I, MAQUET Holding B.V. & Co. KG, Rastatt, Germany) cooled to the target temperature using a cardiopulmonary bypass cooler system (Stöckert Heater-Cooler System 3T, Sorin Group USA). Input and output temperatures were continuously measured using two temperature probes (Mon-a-Therm, Covidien Medical Equipment, Dublin, Ireland) stripped of their plastic insulation, immersed in direct contact with the fluid, connected to a patient monitor (Datex AS/3, Datex Ohmeda Medical Equipment, GE Healthcare, USA) and recorded using a designated computer software. Fluid warmers were evaluated at an input temperature of 10°C and 20°C (input temperature ±1.5°C), at flow rates of 50, 100 and 200 mL/min of normal saline solution. All measurements were performed at a controlled room temperature of 20°C–25°C. Device batteries were charged to 100% prior to each measurement. To validate our findings, we performed five evaluations with each device in each condition (flows and input temperatures). Figure 1a depicts the design and structure of the fluid warming test system. Experimental system design. (A) Warming performance evaluation system. (B) Flow resistance measurement system. The maximal output temperature, running time (defined as the time a device was able to maintain stable output temperature of more than 5°C above the input temperature), average temperature during the running time and calculated energy transfer (determined by the total difference in temperature multiplied by the heated volume, using a 5 s interval) were measured and calculated using a flow rate of 50, 100 and 200 mL/min at input temperatures of 20° C and 10°C. We used the calculated average temperature of the infused volumes as clinically relevant measures of the warming properties. The average temperature of the first, second, third, fourth and fifth infused litres were calculated by using average temperature over time required to infuse the specific volume (eg, the average output temperature of the first litre at a flow rate of 50 mL/min is the average output temperature over the first 20 min). Fluid warmers resistance to flow was assessed by connecting a fluid bag compressed by a medical grade pneumatic pressure infuser (1-L Pressure Infuser Irrigation Pump, ConMed, Utica, New York, USA) via a standard 120 cm infusion set (AS2100SI-G Blood Administration Set, Amsino International, Pomona, California, USA) connected directly to the fluid warmer. A 14G intravenous catheter (BD Venflon, BD, New Jersey, USA) was connected at the exit port of the fluid warmer. The fluid bag was set at a height of 100 cm above the fluid warmer and the intravenous catheter, effectively creating a baseline pressure of 74 mm Hg. The infuser pressure was set to four different target pressures (0, 100, 200 and 300 mm Hg) above the baseline pressure. The time required to pass a volume of 500 mL via each warmer was recorded using a stopwatch by continuously collecting and weighing the infused volume using a medical grade scale. The measurements were performed using normal saline solution. Figure 1b depicts the structure of the fluid flow resistance test system. Differences between the measured and calculated heating properties of the four devices were evaluated using Kruskal-Wallis one-way analysis of variance under each condition. P values lower than 0.05 were considered significant. Throughout the manuscript, results are presented as average±SD unless otherwise specified. The disposable weight, battery weight, operating weight (weight of the connected unit, disposable, cables and battery), disposable priming volume, battery energy capacity and warming method of the tested fluid warmers units is displayed in table 1. Each fluid warmer was evaluated at input temperatures of 10°C and 20°C. Five measurements were performed at every flow rate. We used flow rates of 50, 100 and 200 mL/min of normal saline solution which seems to encompass the range relevant to out of hospital care and transport of patients with trauma. A total of 120 measurements were recorded over more than 6500 min. A graphical representation of a full set of single measurements of the output temperatures over the infused volume (which is directly related to time, as the flow rates were fixed) in all study conditions is presented in figure 2. Examples of single measurement of output temperatures as a function of the volume passing through the warmer under the different conditions. Input temperature: left 20°C (A–C), right 10°C (D–F). Flow rates: top 50 mL/min (A and D), middle 100 mL/min (B and E), bottom: 200 mL/min (C and F). Different line types represent the different heating devices (thin grey, Buddy Lite; dashed, enFlow; dotted, Thermal Angel; thick grey, Warrior). The maximal output temperature, running time, average temperature during the running time and calculated energy transfer at flow rates of 50, 100 and 200 mL/min and input temperatures of 20°C and 10°C are presented in table 2. The average output temperatures (throughout the running time) as a function of the flow rates are depicted in figure 3 (top). The calculated energy transfer (which also incorporates the amount of effectively heated fluids) at different conditions are detailed in table 2 and also presented in figure 3 (bottom) as a function of the flow rates. Not surprisingly, in most devices, the output temperature dropped with increasing the flow rates, but the energy transfer increased, as heat losses were decreasing and larger volumes were effectively heated. This did not occur when the device was not able to stabilise its output temperature (eg, the Buddy Lite at low input temperatures), in which case energy transfer decreased as well. Output temperature (top: A and C) and energy transfer (bottom: B and D) as a function of flow rate for the different heating devices. Input temperature: left 20°C (A and B) and right 10°C (C and D). Different line types and markers represent the different heating devices: black X, Buddy Lite; dashed square, enFlow; dotted triangle, Thermal Angel; grey circle, Warrior. At an input temperature of 20°C and a flow rate of 50 mL/min, the enFlow warmed over 2.4 L to above 36°C before depleting the battery, over 2.8 L at 100 mL/min with minimal decrease in output temperature and over 3.3 L at 200 mL/min with average output temperature of 34.2°C. At an input temperature of 10°C and a flow of 50 mL/min, the enFlow warmed over 1.6 L to above 36°C, with an increase in total heated volume and a substantial decrease in output temperature as the flow rate increased to 100 and 200 mL/min (1.8 and 2.3 L, at 33.7°C and 25.7°C, respectively). At an input temperature of 20°C and flow rates of 50 mL/min and 100 mL/min, the Thermal Angel warmed just under one litre to approximately 36°C. As flow rate increased to 200 mL/min, nearly 1.5 litres reached a substantially lower temperature of 31°C. At an input temperature of 10°C and a flow rate of 50 mL/min, the Thermal Angel warmed under 700 mL to 34°C, with an increase in total heated volume and a further, substantial decrease in output temperature as the flow increased to 100 and 200 mL/min (800 mL and 1.5 litres, at 29.4°C and 20.9°C, respectively). At an input temperature of 20°C and a flow rate of 50 mL/min, the Warrior warmed over 3.5 L to an average temperature of 37.8°C. Flow rates of 100 and 200 mL/min increased total heated volume with small effect on the output temperature (4.3 and 4.8 L at 37.1°C and 36.1°C, respectively). This behaviour persists at an input temperature of 10°C—warming 2.6, 2.9 and 3.3 L to 36.9°C , 35.9°C and 34.4°C at flow rates of 50, 100 and 200 mL/min, respectively. The resistance to flow was tested at four input pressures, using normal saline solution at an ambient temperature of 20°C. The flow rate of the fully connected infusion system (all the way to the intravenous needle) including the fluid warmers is presented in table 3. A graphical representation of the data is presented in figure 4. To put this into perspective, the gravity driven flow rate through a 14G intravenous catheter without a warming device amounts to 198 mL/min. It can be seen that the enFlow had a minimal impact on the flow, whereas the other devices had a larger effect. Flow rate as a function of the input pressures. Different line types and markers represent the different heating devices: black X, Buddy Lite; dashed square, enFlow; dotted triangle, Thermal Angel; grey circle, Warrior. This study demonstrated significant differences in the heating performance of the fluid warmers, with the differences becoming greater as the input temperature decreased and the flow increased. Previous studies comparing portable battery-operated fluid warmers to stationary, external electric AC power operated fluid warmers demonstrated superior performance for the latter.6 However, the use of these devices is not always possible out of hospital, for first responders, transport and military situations. A performance evaluation of the enFlow, Buddy Lite and Thermo-Sens demonstrated a faster arrival to the target temperature of the enFlow, while the Buddy Lite failed to reach the target temperature with higher flow rates.5 However, the behaviour of the warming devices after achieving the target temperature had not been assessed. Another comparison between Buddy Lite and enFlow4 showed similar results of significantly higher output temperatures and shorter time to reach target temperatures for enFlow compared with Buddy Lite, limiting the effectiveness of Buddy Lite to low flow rate and high input temperature in accordance with our results. Assuming minimal environmental heat losses, the maximal heating capability of a fluid warmer with 100 Wh battery is warming 3 L from 10°C to 38.6°C. As the Buddy Lite battery contains 89 Wh and the Warrior 99 Wh, these devices should in theory be able to warm roughly 3 L from 10°C to 35°C, while enFlow, with its 66 Wh battery and Thermal Angel, with its 30 Wh battery, would be able to warm only 2 L and 1 L, respectively. Heat losses are time dependent. As high flow reduces the infusion time, it minimises energy losses and maximises energy transfer to the fluid and hence to the patient. 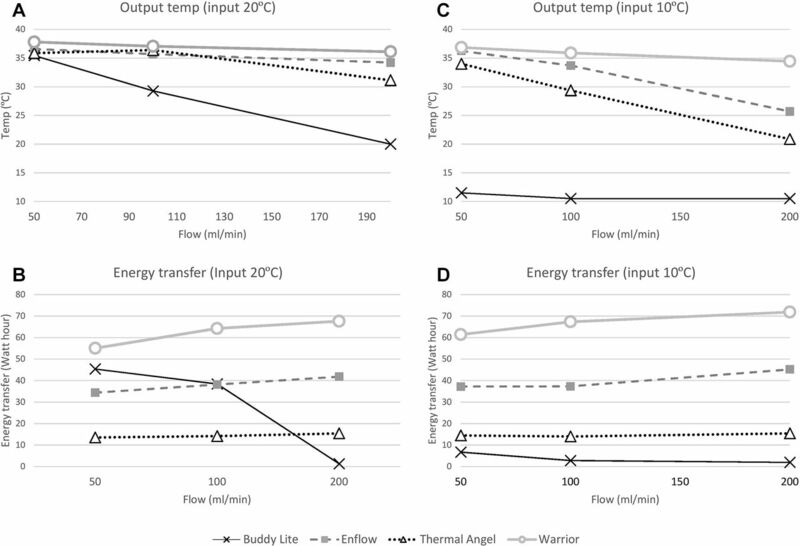 Except for the Buddy Lite (which does not effectively transfer energy at either high flow rate or low input temperature), the enFlow, Thermal Angel and Warrior present a substantial 10%–20% increase in energy transfer with rate rise from 50 to 200 mL/min at both high and low input temperatures. As a lower input temperature requires more energy, it further shortens the heating process, which translates to an even higher energy transfer. Our results (table 2 and figure 3) clearly reflect these effects. In agreement with the previous studies,7 we found that gravity-driven infusion through fluid warmers and a 14G intravenous catheter may reach flow rates of 150–200 mL/min. Pressurising the infusion bag can double or even triple these flow rates, highlighting the fact that fluid warmers are expected to function at a wide range of flow rates. In contrast to energy transfer, the output temperature is expected to decrease as flow rate increases, since the time for energy transfer shortens. Indeed, as seen in figure 3, the fluid warmers output temperature decreased as flow increased and input temperature lowered. The Buddy Lite is an outlier, as it failed to warm the fluid at high flow rates or low input temperatures. An ideal portable battery-operated fluid warmer should be small, light, durable and simple to operate while being able to warm at least 2 L of fluids at a wide range of flow rates and input temperatures and to provide a high, steady output temperature. It should be noted though that the improved heating properties of the Warrior and enFlow come at the expense of a bulkier and heavier device and battery. The fluid warmers were tested under ideal conditions, while immobile, located at room temperatures and with fixed input temperatures and flows. Thus, the results obtained can be viewed as an upper limit for the warmers’ capabilities. In real life, they may not reach the performance reported here. Furthermore, we did not test the fluid warmers with refrigerated blood—a fluid which they are commonly used for. However, as the behaviour of most warmers changed in linear relation with the input temperature, we believe it is safe to extrapolate our results to refrigerated blood. We found that enFlow and Warrior function reliably as expected from their specifications. When using the Thermal Angel, flow should be limited when input temperature is low and note should be taken of the small capacity battery that may limit operation when large volumes or prolonged infusion times are required. We suggest that the use of the Buddy Lite should be limited to scenarios requiring low infusion rates and only when input fluid temperature is relatively high (ie, fluids are not refrigerated). The Warrior provided the best performance at high infusion rates and low input temperatures, warming the largest volumes in these conditions, but is the largest and heaviest. As significant differences between the four devices were noted, clinicians should be aware of the limitations of each device to best match it to the planned clinical use. The authors would like to thank the department of anesthesiology, RAMBAM health care campus, Haifa, Israel for funding this study, QinFlow Ltd, Tel-Aviv, Israel for providing Belmont Buddy Lite, Estill Medical Technologies Thermal Angel and QinFlow Warrior units for testing, Israel Defense Forces, Medical Corps for providing CareFusion enFlow for testing and Ronit Leiba for the help with the statistics.
. Design and demonstration of a battery-less fluid warmer for combat. J Spec Oper Med 2013;13:31–5. Contributors AL, AR and RH were involved in the study system design and production. AL, RJ, RH and AR were involved in the acquisition of data. All the authors contribute to the study conception, design, analysis and interpretation of data, drafting and critical revision of the manuscript. Funding The study was funded by the department of anesthesiology and some of the equipment was supplied by the IDF and by Medical Technologies. with no external grant support. Competing interests AR reports receiving consultant fee from Medtronic outside the submitted work. This project received non-financial support from QinFlow Ltd, Tel-Aviv, Israel (providing a Belmont Buddy Lite, Estill Medical Technologies Thermal Angel and QinFlow Warrior units for testing) and from the Israel Defense Forces, Medical Corps (providing CareFusion enFlow unit for testing).